Sam gets a really nice Corduroy Jacket in S2. It’s got two breast pockets. It has snaps not buttons. It’s also lined with cozy white fleece. It first appears in Born Under a Bad Sign (2x14). Sam is wearing it when Dean comes to get him after he phones. He takes it off when he changes into a clean shirt, but puts it on again when they go out. He wears it to Duluth where he tracks down Jo, then takes it off after as he talks to her. He does not wear it again for the rest of the episode. (In Hollywood Babylon (2x18), at least three of these jackets are seen on a wardrobe rack that is pushed past Sam and Dean while they walk to the trailer to watch the dailies). In Bad Day At Black Rock (3x03), Sam changes into it after Dean rescues him from two hunters, until the end of the episode. In Dream A Little Dream Of Me (3x10), Sam wears it for the almost the whole episode EXCEPT for when they are in the motel room and in Bobby’s dream. He changes out of it once he kills Jeremy and wears a different jacket for the final scenes of the episode. 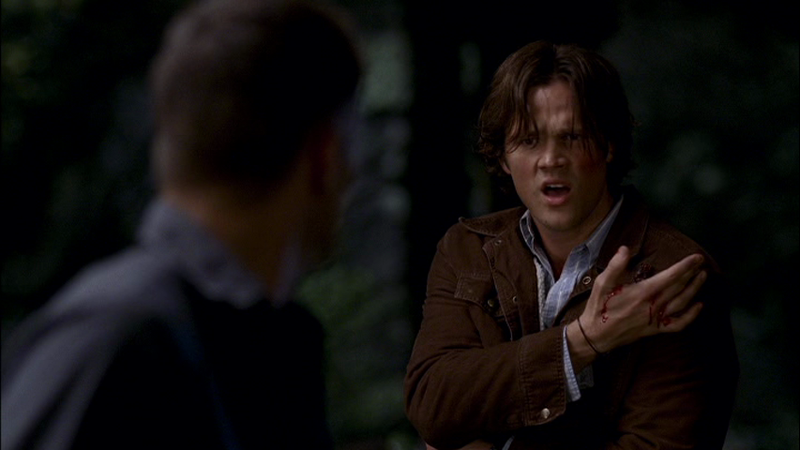 In Time Is On My Side (3x15), Sam wears it at the beginning when they interrogate the demon. At the end of the episode he must get it out of the Impala once Dean rescues him, because he is wearing it when they bury Doc Benton. In Lazarus Rising (4x01), Dean borrows it when they go to see Pamela. He takes it off briefly for the séance and when he is sleeping in the motel room and Castiel tries to talk to him, but otherwise he wears it for the rest of the episode. In The Curious Case of Dean Winchester (5x07), Sam wears it from when they go to the motel to track down missing-person Cliff, until after he wins the poker hand and saves Dean. In the final scene, he picks it up as he walks out the door, but does not put it on. In Changing Channels (5x08), Sam wears it during the opening theme song when he laughs at Dean getting grease on his forehead. In Mommy Dearest (6x19), Sam wears this coat to Grants Pass, Oregon, and keeps it on for the rest of the episode. In The Man Who Knew Too Much (6x22), Sam wears this to the alley where they find Eleanor Visjak and Castiel destroys Sam’s wall. Subsequently, Sam is also wearing this in his own mind (only taking it off to fool Soulless!Sam inside the dream). 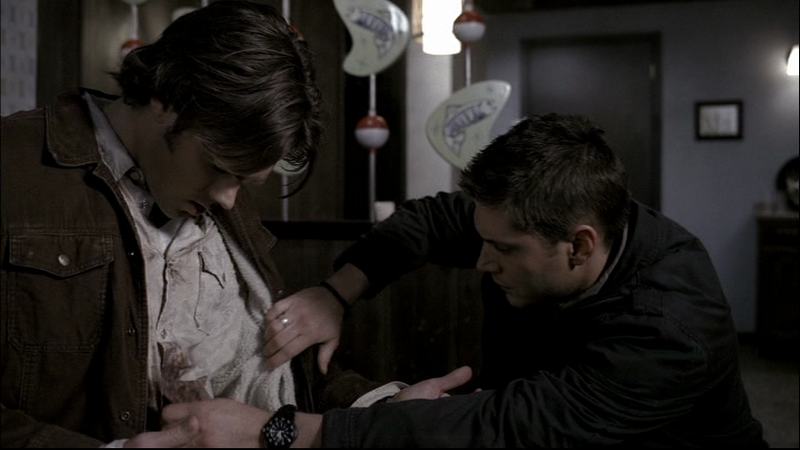 In real life, Dean takes Sam’s jacket off while Sam is lying in the panic room. Sam puts it back on when he wakes and joins Dean and Bobby at the end of the episode. Sam is still wearing the jacket, of course, as the scene at Crowley’s lab continues in Meet The New Boss (7x01), but when Sam wakes up at Bobby’s place, he is no longer wearing it. In Of Grave Importance (7x19), Sam wears the jacket for the entire episode. We only see him without it when he is inside the restaurant or inside the motel room. In LARP and the Real Girl (8x11), Sam wears this jacket in the beginning of the episode when he and Dean are in the car and when they are saying goodbye to Charlie after the case, and Sam decides they should stay for the Moondoor battle. In Remember the Titans (8x16), Sam wears this coat when they are talking to Haley on the picnic bench outside their motel room. He wears it for the rest of the episode, except when he is inside the motel room or researching at the bunker. In Sharp Teeth (9x12), Sam wears this jacket when he and Dean are on their stake-out outside Garth’s in-law’s farm house. He wears it for the rest of the episode. In Meta Fiction (9x18), Sam wears this jacket from when he and Dean track down Gadreel until the end of the episode. In The Hunter Games (10x10), Sam wears this coat to go get Metatron with Castiel, and to meet Crowley in the alley – otherwise, he is indoors and does not wear a jacket. In The Vessel (11x14), Sam wears this coat in the final scene when he and Dean are on the pier trying to come to terms with what has happened. In Red Meat (11x17), Sam wears this coat at the very end of the episode when he’s discharged from the hospital. FATE: Sam leaves it behind in Jo’s bar in Duluth in Born Under a Bad Sign (2x14). We see Dean carry his own jacket out, but not Sam’s, when he leaves to follow. They must have recovered it somehow after exorcising Meg though, because it reappears in later episodes. Again, miraculous jacket recovery – there is no visible damage when it resurfaces later. So smart money's on Meg being the one who acquired it? Actually no, I should make that clearer...smart money is on them going back to Duluth after exorcising Meg so that Sam can get his jacket and apologize to Jo. The first time Sam wears it, he's possessed and hasn't been anywhere near his duffel bag in a week, is more what I meant. Oooo...yeah, actually that makes sense. 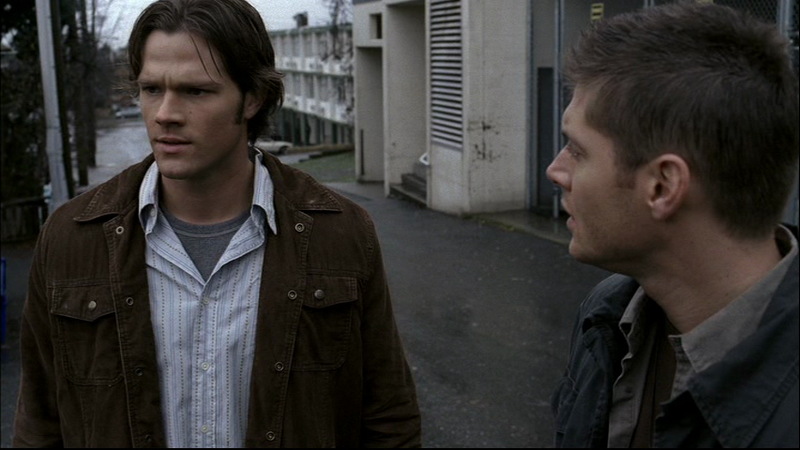 Though, in S2, Dean also gets a new jacket that makes it's first appearance in BUABS. So, it could be that right before Sam disappeared, he and Dean went shopping. Sam gets a total of 3 new jackets in S2, only one of which he loses. Dean wearing it in 4.01 is the best, though! I randomly like that Dean has to borrow Sam's clothes. It's one of those things you don't nececcary think about, but he wouldn't nececcary have access to his own clothes at first. What I really want to know is how a jacket wardrobe got for Jared to wear in 2006 still fits him in 2014?!?!?! I love your website but I'm having trouble purchasing item or finding places I can buy exact replica of Supernatural's clothing for myself to own. I'm a huge fan of the show.I'm getting extremely frustrated so I was wondering if you could help me. Unfortunately, I really can't help. Besides just looking online at the brand names (the boys where a lot of Carhartt, for example) or looking through ebay, I really have no suggestions. I know there are people out there who collect the clothes, but I'm not one of them and I don't know what their secrets are or how they manage to track down everything. Best of luck! Sorry I can't be of more help.